Heads up! Mount network equipment vertically to save space. Space too tight for a full-sized cabinet or rack? 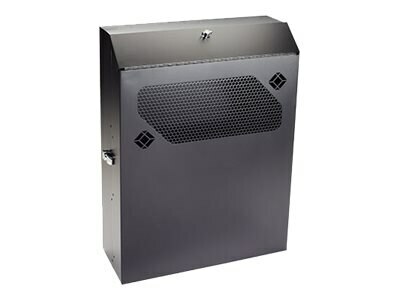 Mount your networking equipment vertically in the Low-Profile Vertical Wallmount Cabinet. This keeps networking equipment out of the way while connectors stay easily accessible. Locking, heavy-duty 18-gauge steel cabinet is a good choice for industrial spaces and small organizations; wallmountable up to 200 pounds of equipment. To secure equipment, both the top panel and front door lock. Mesh cutouts on the front door keep equipment cool. The interior design of the cabinet provides four inches of space for cables and cable managers The cabinet includes adjustable square-hole rails.